Submitted by Stefan Drissen on Tuesday, May 15, 2018 - 22:53. 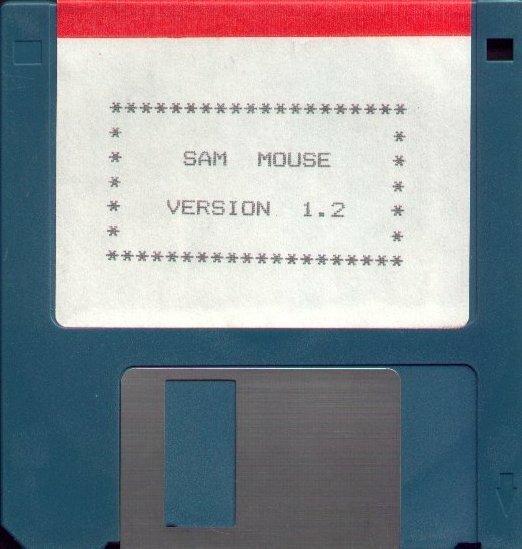 The Official Sam Mouse interface used and Atari ST type Mouse as opposed to the then more common serial mouse. 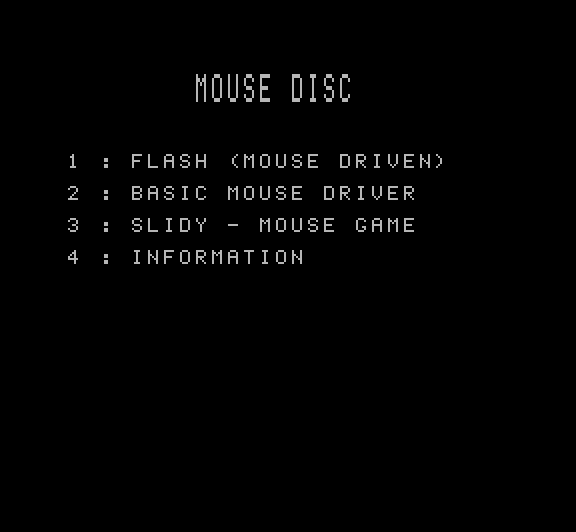 The mouse driver code once loaded would populate the variables XMOUSE, YMOUSE and BUTTON that could be read by the user. The disc contains a Basic demonstration, a (poorly) modified version of Flash! 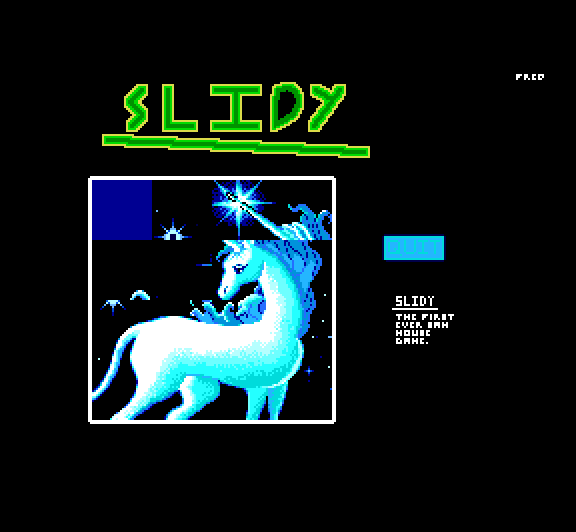 and a ‘Slidy’ game by Richard Robinson that was modified by Colin MacDonald to use the Sam Mouse. Many games such as Lemmings and Batz 'n Balls were best played with the mouse and for Basic users Steve Taylor ’s Mouse Driver 2.0 offered an interrupt-driven pointed system. There are issues when using the Mouse Driver and other pieces of code as noted by Geoff Bridges . If the E-Tracker player was loaded first, then the music was lost when the mouse driver was loaded and if the mouse code was loaded first then mouse control was lost when the music code was loaded. Whats happening here is simply that both programs load their code into the same place, so the second one loaded overwrites the first one! The area selected for the code is the system heap starting at memory location 16384. Space can be reserved in the heap for a code routine and the mouse driver program does this automaticaly, but the E-Tracker loader does not. Heap space can be reserved in machine code by calling the ROM routine at address 262 or by using the RESERVED function in MASTERBASIC. There is no command in SAM BASIC to reserve heap space but the system variable HEAPEND (SVAR 456) can be poked with the new heap end. Assuming that the code starts from 16384 (which is the case for the E-TRACKER code), the value to poke to SVAR 456 is 16384+ 125(the code length). This can be poked before OR after the E-TRACKER code is loaded, but MUST be poked before the mouse driver code is loaded. The modified "Int-music" listing is below. Note that the program has been RENUMbered and so the lines may not be the same number as in the original. e pointer"'"POKE SVAR 666,1 to 7 to enable pointer"
Lines 20 to 50 are the new additions. The IF....END IF sequence is used to avoid reloading the mouse driver if the program is stopped and then re-RUN. Line 150 turns the music on and activates the mouse pointer. Lines 310 to 360 are a 'test' routine to show the use of the mouse and music combination. Pressing the left button with the pointer on the top line of text will turn the music on. Pressing the left button on the second line of text will stop the music. The PAUSE in line 345 is to slow down the DO..LOOP to enable the mouse driver to update the position readings. In normal use there would be more program code to allow enough time for the mouse update. Replacement Atari mice are hard to source so an alternative is to use any USB mouse (not just those that support PS/2 protocol only) and this interface wired for Atari pin out https://www.waitingforfriday.com/?p=827, this has been tested and works fine with the Sam with both wired and wireless optical mice.